10 of the Best Food Truck Festivals to check out this year! As far back as 1691, food vendors in New York City were selling their wares from pushcarts. Fast forward to the 1960s, when those elegantly-named "roach coaches" began showing up at construction sites around the country. But food trucks have gotten a makeover in recent years. Instead of the usual greasy burgers and unidentified "street meat," you'll find gourmet fare, tasty regional and international cuisine and craft cocktails. The trend even has a fancy new name: "mobile cuisine." Food truck festivals are a fun (and delicious) way to sample local foods, all in one place. Three pieces of advice: arrive early (lines tend to get long pretty quickly). Pace yourself (the free entertainment at most festivals gives your tummy a time-out). And, most importantly, wear stretch pants. Hit this part of Cape May for a festival showcasing great food from the Delaware Valley area. For three days, chow down on waffles, lobster rolls and killer barbecue. That's just for starters. This beachfront festival has become so popular, it's held two times during the season. Food trucks from one city compete against the other two to show off their best stuff (and be judged for cash prizes). You can also vote by phone as you work your way through everything from seafood to Sambonis. There's also live music, and proceeds benefit local charities. The biggest food truck festival in the Southeast serves up everything from crepes and kebobs, to those Southern staples, chicken and waffles, and fried green tomatoes. There's plenty of live music, and part of the proceeds benefit a local charity supporting the restaurant community. Over 100 trucks roll in from all over the country -- and the variety presents a dilemma: what to eat first? Moonshine beef jerky? Crab cakes? Gelato? You'll have two days to take it all in. And all that gorging helps benefit local charities. They bill themselves as the largest food truck festival in the Midwest - and with 70 trucks and three days to sample them, they're right. Bite into brisket sandwiches, "brats," Caribbean food, fresh soba noodles and more. Walk it off by checking out the local crafts and live music. Since its inception in 2011, it's grown from just three trucks to several dozen - which attracts thousands of enthusiastic foodies. Besides the local fare, visitors enjoy the craft beer garden, live music and the fact that dogs are welcome. It's taken off in the last couple of years to become a big event in the LoneStar State. Dozens of trucks gather, dishing out everything from sliders and Tex-Mex staples to Cajun, Thai and Latin American cuisine. Listen to the live music as you digest it all. Sixty-five trucks share five acres with chefs giving cooking demos, folks attempting to win various eating contests and kids trying not to throw up in the bounce houses. Foodies can sample everything from Cajun to sate to fry bread -and wash it down with craft cocktails. Enjoy some of the most delicious - and diverse - food in the Northwest at this popular two-day festival. 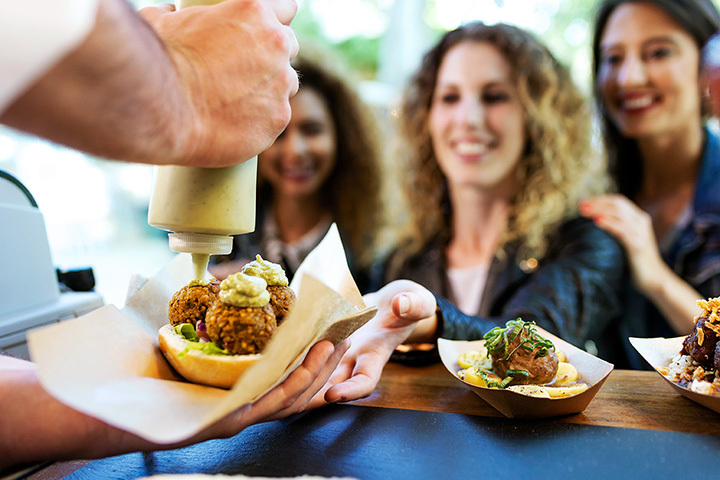 Burgers, baguettes, falafel, dumplings and hot donuts are some of the fare served from food trucks. But there are also dozens of pop-up stands showcasing yummy things from Greece, Vietnam and Japan. The modern food truck craze got its start in L.A., so no surprise the city should host one of the best festivals in the country. Since 2010, this event has been showcasing over 100 trucks, as well as samples from the best food carts, stands and restaurants - some as far away as Mexico.